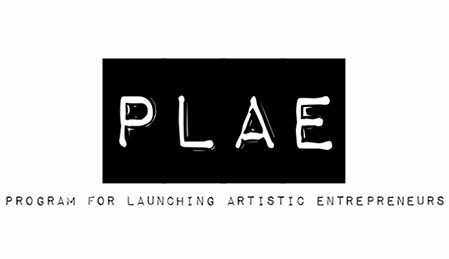 PLAE is a yearlong development program that encourages a group of self-motivated people to become the arts and business leaders of tomorrow. The application period for the 2015 session of PLAE is currently open! Artistic Entrepreneurs who are seeking to develop a new business idea or company will be equipped with the tools to realize their goals during the course of this class. You will meet once a month and will hear from featured guest speakers who are leaders in the fields of both arts and entrepreneurship. These experts will participate in the discussion of your project as well as offer guidance and support to you and your classmates. At the end of the program, participants will be given the opportunity to present their business to a room full of connectors, investors, business owners, and business experts. This course will thrive if it is full of people who are seriously committed to starting something new and exciting. If you are an artist or an entrepreneur with an artistic idea you are eligible to apply for one of only 10 slots available. During PLAE, you will participate in interactive activities and group discussions as well as reflect on the growth of your business and the businesses of your classmates. Beyond the monthly class, you will be invited to additional events and educational opportunities that may also help with your business development. The class will be structured around the selected applicants. You will be taught how to create an action plan and will be encouraged to implement and test a new task or initiative every month. You and your classmates will work together in groups as well as on your own to complete the tasks that have been outlined. Similar classes and incubator programs can cost up to $36,000 per year because they charge $1,000-$3,000 per month. The cost of this one-year program is $1,000, which covers 12 three-hour classes plus satellite events. That breaks down to less than $85/month. We keep the cost of the class low because we believe in supporting bootstrapped ventures and we understand that your budget can be tight when you’re starting something new. Why is PLAE a yearlong program? It’s important to give yourself enough time to test and monitor your progress. By making the class last for a year, you’re able to spend at least a month testing what you learned in the previous month’s class. Additionally, it may take several months for you to be ready to use some of the information shared in a particular class and we want to be there to support you in trying new things and reflecting on your work. Who should apply for PLAE? PLAE is a class for self-motivated individuals. Chances are, if you’re reading this FAQ then you have an arts-based business idea or are a freelance artist who is looking to invest in the business of you. Past participants have included a wide variety of individuals including actors, film makers, comedians, musicians, dancers, arts administrators, and art gallery owners. We encourage diversity in the participants so if you’re ready to start working on building or growing your business, company, or idea then you should apply! How much time will I be spending on this work outside of the scheduled class time? It is up to you whether you attend any satellite events we host or suggest. Otherwise, the workload will vary depending on your goals and where you are in the process. Expect to do a little bit of work each day. This could be a few minutes composing social media posts or an hour of journaling, depending on what you need in order to succeed and where you are in your process. Ultimately, it’s up to you to determine how much time you invest in your business outside of the monthly three-hour classes. What have alumni of past programs accomplished? If you haven’t read them already, check out the testimonials above. Alums of past PLAE sessions have gone on to start their own festivals, tour their shows internationally, raise awareness about issues important to their message, start their own theatre and dance companies, and make enough money from their businesses to quit their day jobs. If you have to miss a class we’d be happy to send you an email summary of what you missed as well as send you any worksheets or handouts that were shared. We would also encourage you to speak to your classmates about their experience in the session you missed. Who are the experts who will be guest speaking? Because PLAE is built around the participants, we don’t book guest speakers until we have a good idea of who will be in the class. You should expect to hear from successful arts entrepreneurs as well as marketing, law, management, accounting experts, fundraisers, funders/investors, and more.